The content on these pages is provided for information only, and may not be used for commercial purposes. Any non-commercial or educational use must be acknowledged appropriately. Where images or text show the name of the source, they may only be viewed on this site, and no other use may be made of them except with the owner's permission. Use of this site constitutes acceptance of these conditions. As with any research, 100% accuracy cannot be guaranteed, and we do not claim such accuracy. St Mary's is the parish church of Acocks Green. It is not the oldest church in the area, however. That distinction goes to a Congregationalist chapel of 1827 on Stockfield Road, later replaced in 1860 by a church at the Warwick Road end of that same road. In fact Zaccheus Walker of Fox Hollies Hall offered land for an Anglican church at the end of April 1860, but nothing came of this. The Congregational church opened in June of that year. There are several useful pieces on the history of the church, and we have decided to transcribe them instead of amalgamating them. They were written at different times, and reflect those times in style and content. The differences are also useful because St. Mary's was bombed in December 1940, and some features were lost. In 1966 the church celebrated its centenary, and C.J.G. 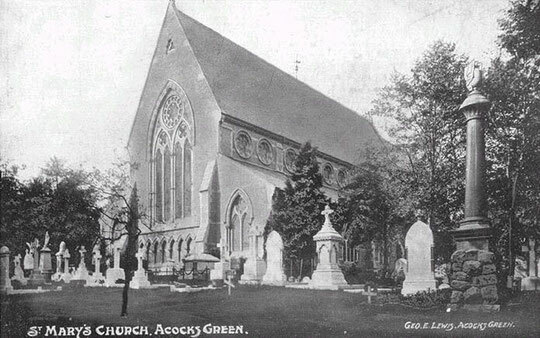 Hudson wrote a booklet about Acocks Green, which was partly intended to celebrate the centenary and bring the history of the church up to date. St. Mary's used to have several outlying buildings. The Church House opened on Friday 4th December 1908 at the corner of Arden Road and Rookwood Road, and since about 1983 has been in the hands of Birmingham City Mission. A mission room was opened at Spring Road in 1881, and was moved to Summer Road as St. Gabriel's when the North Warwickshire Line was about to be built, c. 1905, as the line would have gone through the chapel. This mission room was replaced by a Memorial Hall in 1928/9. The idea had been to have a permanent chapel there, but it was decided that a room for social and recreation purposes was needed. Another room, the Jubilee Hall behind the Memorial Hall, was opened in 1936: money for it was raised in part by Leonard Skan, a well-known local milkman. There were tennis courts and other sports facilities on site (thanks to Kath Huckfield for help with this information). The Memorial Hall site was eventually sold to ROSPA. Bishop Westcott Hall at the end of Greenwood Avenue opened in 1936. That was used for church activities. It was leased to the City Council in the 1980s as a community centre. One curiosity is that St. Mary's got into the Guinness Book of Records! "The fastest white wedding on record and hence the most frustrating for any mother-in-law was one on 22 Sept. 1939 between Mr. & Mrs. T. G. Franklin when 71 hours elapsed between proposal and solemnization at 4.30 p.m. at St. Mary's Church, Acocks Green, Birmingham two hours after obtaining a special licence. The brides' white and bridesmaids' lavender dresses surprised the bridegroom." There are several graves particularly worthy of note in the churchyard. There is a tall marble column, which at a casual glance might be thought to commemorate some local bigwig. However it is the name of Emily Palmer which is prominent. She was shot in the White Hart pub on 27th December 1884 by a man called Henry Kimberley, whose common law partner Harriet Stewart had left him. Kimberley had already shot Miss Stewart, and Mrs Palmer tried to intervene, and got shot for her pains. Harriet Stewart survived but Emily Palmer did not, and she died on 8th January 1885. The funeral was on 14th January, and many boys stayed away from St. Mary's school to go to it, according to the log book. The murderer was hanged in Winson Green on 17th March 1885. 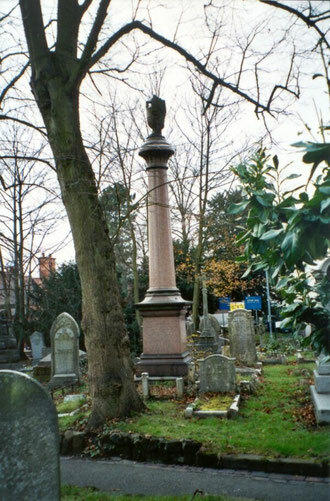 Thomas Palmer, her husband and licensee of the White Hart, is also on the memorial: he died three years later, when he was living at Broadyates. The large monument was paid for by the Licensed Victuallers Association. My wife and I have taken a keen interest in Emily over the last few years as she is one of the main characters of our Birmingham Ghost Walk - my wife leads the walk in the character of Emily. Henry Kimberley is 'reported' to haunt the site of the White Hart in Paradise Street (now the site of Fletchers Walk) and was the first person to be hanged at Winson Green Prison (it opened in 1849). We also talk about Emily's funeral in our Crime and Punishment Walk - Emily's husband owned several pubs in Birmingham city centre and both he and his wife were well known - and apparently well liked. The funeral procession started at their pub in Steelhouse Lane and went all the way to Acocks Green. The local papers heavily reported the death, trial and funeral and the local licensed victuallers association paid for the memorial. Another grave belongs to Philip Perks, a local builder, who died in January 1933. In contrast to other graves, his is rather prominent in black marble. However its appearance is spoiled somewhat, as it has a corner missing due to wartime bomb damage. Some of the other splendid graves are visible here, including the railings surrounding the grave of the Rabone family of Stockfield House. 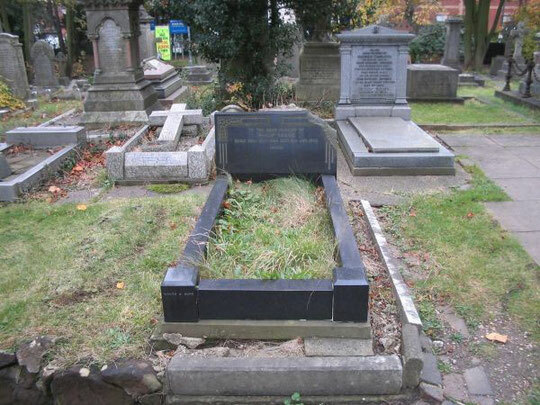 In an article for the Sunday Mercury in 1975, the late journalist and historian Vivian Bird, who lived in the area, wrote about the unmarked grave of Frederick Joseph Trevelyan Perceval, next to Philip Perks' grave. This man was descended from Spencer Perceval, a British Prime Minister shot dead in the House of Commons in 1812, and was the rightful 10th Earl of Egmont. Articles appeared in Birmingham newspapers on 17th and 21st May 1932, after Frederick Perceval's death on 16th five days after he was involved in a car crash at Cadnam crossroads near Southampton. He had moved back to England from Alberta in Canada after the death of his cousin, the 9th Earl. He had claimed the earldom and succeeded after legal investigations lasting a year, and had lived a simple life with his son at Avon Castle, Ringwood, in Hampshire. "Father and son lived a lonely life at Avon Castle, and washed, cooked and laundered for themselves", the Birmingham Gazette wrote. Frederick Perceval was described as the Rancher Earl in the articles. Vivian Bird posed the obvious question: why is the grave unmarked? There is a fascinating story to tell, which reveals much more of an association of the Perceval family with south Birmingham than has been hitherto recognised. Family history researchers will be interested in the index to the Monumental Inscriptions at St Mary's.